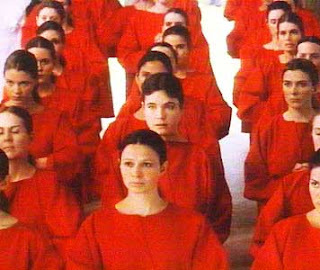 In Margaret Atwood's dystopian novel, The Handmaid's Tale, women are separated by government mandate into two categories: legitimate and illegitimate. The legitimate women are further divided into seven distinct castes, all of which are based on reproductive ability and economic class, and range from wives (well-married women relieved of child-bearing responsibilities) to handmaids (fertile women who are assigned to high-ranking men to bear their children) to econowives (women who have married low-ranking men and must bear all sexual, emotional and domestic duties). It is a stark, terrifying imagining of a society taken over by a totalitarian theocracy, where women are stripped of all rights, money, jobs, families and systematically placed in their new roles under the guise of moral values. The book came to mind recently with the House of Representative's decision to pass the budget bill that slashes support for family planning and reproductive care. Check out the recent New York Times editorial about the Republican War on Women. At one point in the book, the narrator Offred, who is a handmaid (of Fred), talks about the wife of the household, Serena Joy. Serena Joy was a champion of the new social order before the revolution, gaining celebrity for her rousing speeches about "the sanctity of the home, about how women should stay home." But, the narrator slyly points out, "Serena Joy didn't do this herself, she made speeches instead." And after the revolution: "She doesn't make speeches any more. She has become speechless. She stays in her home, but it doesn't seem to agree with her. How furious she must be, now that she's been taken at her word." I searched page by page to find this passage after I read about Congresswomen Gwen Moore and Jackie Speier, who, conversely to Serena Joy, talked about their own access to reproductive care as young women and cut through the morally righteous rhetoric on the House floor. [I]t is urged [that] the use of the masculine pronouns he, his, and him, in all the constitutions and laws, is proof that only men were meant to be included in their provisions. If you insist on this version of the letter of the law, we shall insist that you be consistent, and accept the other horn of the dilemma….There is no she, or her, or hers, in the tax laws. The same is true of all the criminal laws. I insist if government officials may thus manipulate the pronouns to tax, fine, imprison, and hang women, women may take the same liberty with them to secure to themselves their right to a voice in the government. Women have had that voice in the government for a long time now, and yet, their rights, and the rights of their partners by default, are still being manipulated and eroded. Yes, comparing this situation to The Handmaid's Tale is a bit hyperbolic. But it could be put to good use as a cautionary tale at this moment when extremist views are fueling lawmaking. Labels: health, literature, politics, U.S.